Take this report with a grain of salt. 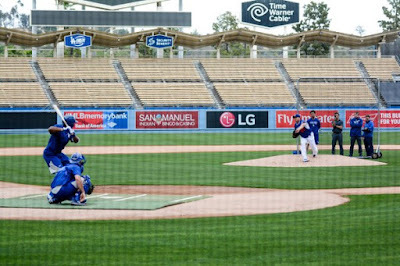 Via Dan Farnsworth at FanGraphs, "Urias and De Leon Look Close to the Big Leagues." I think the Dodgers will be extra careful not to rush either of them; especially considering the lack of innings under their belts. They'll want to stretch them out, so to speak. That said, we should be very happy to have these two kids in the system. 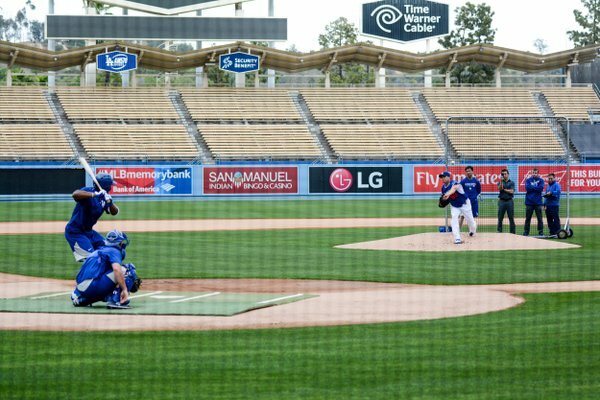 Ryan Walton at True Blue LA visited a recent RC Quakes game and provides a report on Dodger prospect Grant Holmes; "Video of Dodgers' Grant Holmes at Class-A Rancho Cucamonga." Via Tyler Maun at MiLB.com, "Quick learner De Jong dominates for Tulsa." "I was really getting to my back side, really tilting the ball to the bottom part of the zone and then working with Greg (Maddux) about pitch selection and execution and also reading swings," he said. "That was my homework for the week, and obviously, I was able to put in the time. Do we have an eye on another Cuban prospect? Via Ben Badler at Baseball America, "Astros, Dodgers Show Strong Presence At Vladimir Gutierrez Showcase." Via Matthew Moreno at Dodger Blue, "107-Year-Old Irving Piken Meets Vin Scully, Orel Hershiser." Jon Weisman at Dodger Insider shares a video here. Via Ken Gurnick at MLB.com, "Dodgers' Seager still mom's 'baby'"
"He's my baby, so from that respect, it made it a little more difficult," she said. "It's kind of strange sending your 18-year-old into that world that Kyle had already been living in. But Corey has always had to keep up with his older two brothers, and that probably made him a little more prepared. Kyle always gave him pointers, he'd been through it already. It helped him to have an older brother to turn to. But I always hated to send out my youngest." Via Cary Osborne at Dodger Insider, "Farm fresh: Conversion working for Jordan Schafer." The former outfielder has now taken up pitching, and it's been good. “It’s a win-win situation for me,” Schafer told Tulsa World writer Barry Lewis recently. “Most guys fight all their life to make it to the big leagues. I’ve played six years in the big leagues as a position guy already, so if nothing comes from this, it’s not a big deal. FYI, FCC voted to approve the merger between Time Warner and Charter, via David Shepardson at Reuters. Slowly but surely things are progressively moving forward. Before you know it, SportsNet LA will be in every LA home -- or, not.